another visit to the machine! 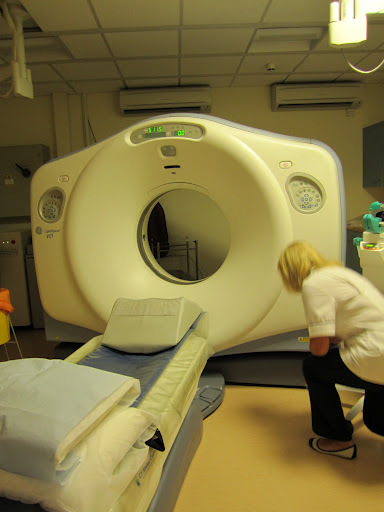 For more details on CTScans see the links in the Right Sidebar on this blog. One always has an element of trepidation (Scanziety!) when faced with a scan of any type, as although one NEEDS to know the answers it could be an answer that is a potential death sentence! The actual process is pain free, no elements of claustrophobia (some people have a problem with MRI Scans) and the sensation of the active ingredients of the disclosing fluid injected through a cannula is not unpleasant but strange and can be a little disconcerting the first time. the cannula was inserted and on through to the CTScanner which stands in a room of its own for radiation leakage and the protection of staff. On the bed which once the staff withdraw from the room slides through the ring of the machine where you are given recorded instructions as to when to breath in and when to hold your breath etc. That done the radiography nurse returns and positions you again and releases the disclosing fluid into the vein via the cannula and then once she has left the room the process is repeated. There are no side effects, no special instructions save only the admonishment to drink lots to flush the disclosing fluid out of the body and home one goes. Now I wait (Super Scanziety!) for the results at my visit to Dr. Jason Lester (my Oncology Consultant) at clinic in Velindre next Friday – will the scan issue a deatjh sentence or a reprieve! This entry was posted in Cannula, Computer Temography, CT Scan. Bookmark the permalink. ← Liver & Colon Cancer – Robin GIBB in remission!